I recently got a new little red sports car. When I got the car everyone told me “oh the police are going to get you now because the car is red.” So even though I drive like Mrs. Magoo, I have been very aware when ever I see a police car the last two weeks. Part of that worrying comes from my father who was a NC state trooper. When he saw my car he just laughed and said when I saw a car like that I would just pull in behind it because eventually they were going to speed. Fast forward to today I went for lunch at Joe’s Crab Shack in Hampton. 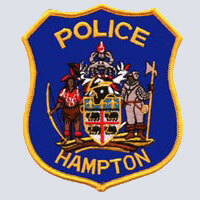 The Hampton City Police were there to greet me at the door. Not for a ticket though. They were doing a fundraiser for the Special Olympics. They helped deliver your order and would refill your drinks. Then they gave you information about the Special Olympics and you could submit a donation if you wanted. The funny thing was that during the meal the Crab Shack turned on the disco ball and the waiters made the police do the car wash dance with them. It was funny a couple were good but several were just happy to be heading in the right direction during the line dance. Everyone was laughing though including the diners. It made me think that as a group these people face danger every day and see the worst in a city. Yet, here they are cutting up with the public and raising money for a worthwhile charity. They made my day and yes I did make a donation. How could you not after they were willing to dance.